Few people had heard of him a decade ago. Today, he’s an international symbol of either freedom or betrayal – take your pick. This essay explores his astrology. Once upon a time not so long ago, Edward Snowden was a young computer expert, well-paid and living a comfortable life. His specialty was computer security and he worked for companies contracted with the National Security Agency. In mid-2013 Snowden suddenly became famous. A series of articles told the world the extent to which the NSA was pervasively spying on Americans in a manner accountable to nobody. His revelations led to a chase from Hawaii to Hong Kong to Moscow where he was stranded without a passport. He has been in Moscow since then. During this time Snowden has become a thorn for US-Russia diplomacy, and an argument over the merits of leaking classified documents that may expose wrongdoing versus the need for maintaining national security. There’s been much commentary over whether he is a heroic whistle-blower, an untrustworthy person with a grandiose notion of his importance, or a traitor to his country. This September 16 the third feature film about Snowden will hit mainstream cinemas around the world. Snowden has become a stand-in for the issue of national security and personal privacy in the modern age. Now that a few years have passed and the US is in the midst of a Presidential election season with a change of administration coming in January, I wonder whether a way will be found for Snowden to return to the United States. We will explore that possibility later, but first here’s his natal chart. The first and lasting impression is the strong influence of Mercury, conjunct the Ascendant in its own sign and oriental (if out of sect in his diurnal chart). Mercury is also the dispositor for his Ascendant and Sun, as well as Mars and the Moon’s North Node, all in Gemini. 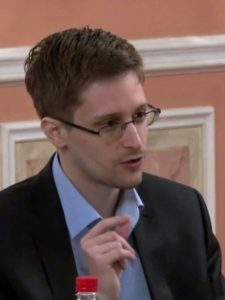 Snowden fits Mercury’s signification in many different ways –a computer specialist, lover of a different languages and cultures, and somebody who experiences changing circumstances of life. His claim to fame is also the activity of Mercury: disclosing secret communication, making what is hidden overt, and sparking meaningful and far-ranging discussions. As a mutable sign of the air element, Gemini is more flighty, breezy, and amoral than is our impression of Mr. Snowden. Instead he worked in a well-prepared and methodical manner with a pretty good sense of the consequences that would befall him. Whether wrong or not, whether self-deceived or not, I do not doubt that Snowden acted according to conviction – not a usual Gemini trait. These conventional attributions or Gemini are compromised by the planet Neptune closely opposing Snowden’s Sun. We see the possibility of self-sacrifice but also self-deception. Either interpretation weakens the Sun’s ability to fulfill its functions in ordinary or conventional ways. Perhaps he won’t ever make it as a hero but he may as a martyr. Moon in Scorpio is a very different planet from those in Gemini. Moon is less overt in the Sixth House and not comfortable in Scorpio. Being in fall in that sign, Moon is more intense and less creature-comfort-oriented than an ordinary Moon. If one was going to spend weeks stranded in the Moscow airport, creature comforts would not be a big priority. However, Moon is applying to Venus in Leo, a more public planet. 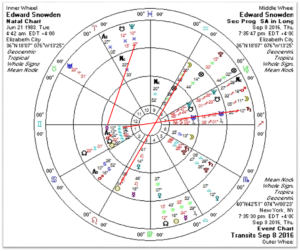 Venus can add charm to the rather taciturn Moon yet Snowden’s approach to life is dominantly mental, reflecting the strong and available Mercury and Gemini. 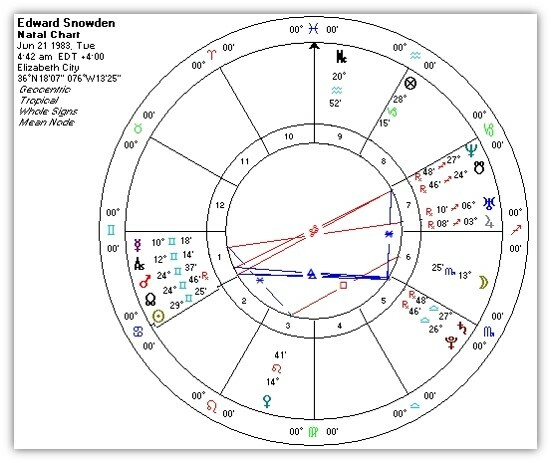 We now take a look at Snowden’s Saturn closely conjunct Pluto in Libra in the Fifth House. Saturn in Libra has dignity, being in exaltation, and is also moving toward its direct station and this increases its potency. Saturn’s conjunction with Pluto certainly brings to mind somebody who can move his or her life in extreme directions, perhaps grimly, humorlessly. It may also signify making a sacrifice for a larger purpose. Yet Saturn and Pluto are both slow-moving planets and anybody born during June of 1983 is going to have this combination. These two planets are in close trine to Sun in Gemini and serve to deepen and darken his Sun placement. We must also consider Snowden’s Lots of Fortune and Spirit. The Lot of Spirit is conjunct the Saturn-Pluto configuration, disposing this may toward decisions that have enormous consequences for him and for others. The bad news is that his Lot of Fortune is in Capricorn, ruled by Saturn; the two planets are also in a Tenth-Sign relationship to Fortune, magnifying their importance – for good or ill. In matters of fortune, those aspects in life over which he has little control, like what country might offer him permanent asylum and how he might get there, whether he can return to the US not in handcuffs. 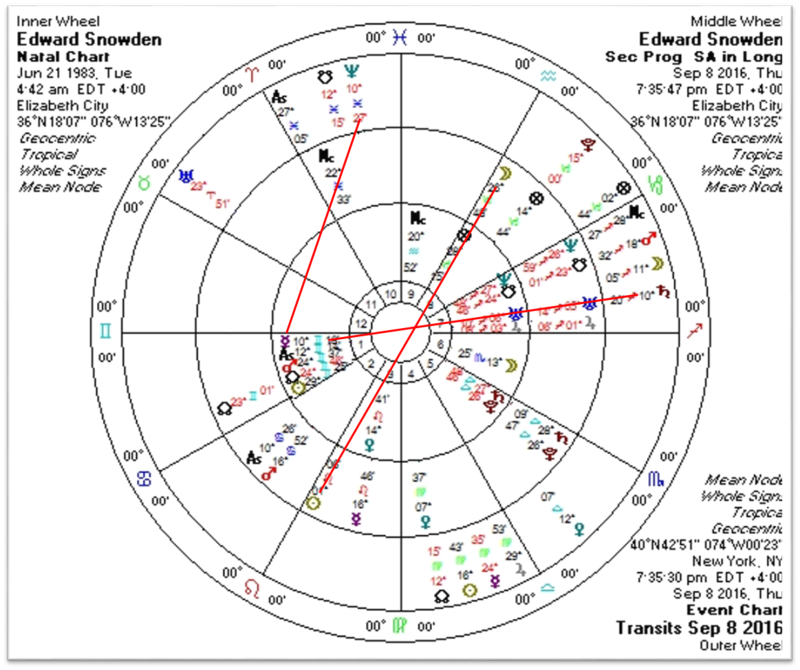 Also important is Snowden’s Jupiter-Mercury conjunction in Sagittarius in the Seventh House. Jupiter is in its own sign, of course, but doesn’t form strong aspects to more personal planets: Uranus, however, is conspicuous by its opposition to Mercury. This inclines Mercury toward unconventionality, sometimes brilliance, or the harsh judgement of mind’s imperatives over one’s personal happiness. Perhaps, when it comes to ethics, Snowden is a Kantian. Looking at Snowden’s fixed stars, we notice a strong influence from the constellation Orion: Betelgeuse, one of Orion’s shoulders, co-culminates with the Sun, and Alniham, the center of Orion’s belt, co-culminates with Mars. Orion gives a charged pioneering (and risk-taking) quality to planets with whom its stars are involved. His transits at the time of his emergence into public view included Jupiter in the late degrees of Gemini: it was conjunct Mars in early June 2013, then opposite Neptune and famously was conjunct the Sun on June 23, the day his US passport was lifted and he was stranded Moscow. During this time Mars was also in Gemini and active in his chart: transiting Mars opposed natal Uranus and was conjunct natal Mercury that month. If there was a time for heroics, this was it. His secondary progressions for this time are also noteworthy and include progressed Sun in square to progressed Saturn. This was exact on his first night at the Moscow airport. 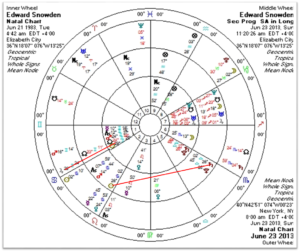 Is there a conflict between a usually positive transiting Jupiter on Sun and the more difficult progressed Sun in aspect to Saturn? 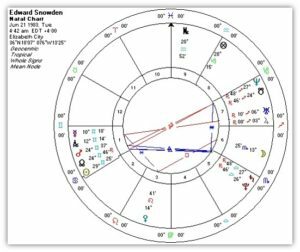 The positive qualities of the Jupiter transit were very temporary; when Jupiter entered Cancer and Snowden’s Second place (in whole signs), things became very confining for him as he began life in diplomatic limbo. The fact that Snowden has left his country and family and embarked onto a period of great personal difficulty is signified more by the phase shift of progressed Sun square Saturn. This progression was proceeded by an equally difficult progressed square of Sun and Pluto a year and a half previously, a factor relevant to his decision to eventually go public exposing the NSA. For many years Snowden has been in a general Saturn period; this encompasses much of his professional life. In early 2013 Sun was his specific time lord, Mars would be a third-order lord for June 2013. These would signify his sudden move into prominence and notoriety and this would last until the middle of 2014. At this time moment don’t look terribly encouraging for Snowden, if you just look at his transits. The ugly Saturn-Neptune square is transiting his natal Mercury, to the degree, right now; Saturn will move on toward his other planets in Gemini but Neptune will continue to be in opposition to Mercury until February 2017. Mars, currently in its transit through Sagittarius, has been in opposition to all his planets in Gemini. The long term is more promising. By progression his Sun entered Leo a year ago and right now progressed Sun is in trine with progressed Jupiter; the Oliver Stone movie that Snowden cooperated with only reluctantly, may be successful and promote his cause around the world. His progressed Moon, now in gloomy Capricorn, moves into Aquarius at the end of this year and in late January 2017 he has a Progressed Full Moon that can mark some kind of culmination. Both progressed configurations promise some kind of positive solution. Looking at his current decennials we find more support for a happy conclusion – or at least happier. Unfortunately for Snowden he entered a Moon-Moon decennial in the spring of 2015, but times do change. In April 2017, six months from now, he enters a Moon-Jupiter phase, and remember that Jupiter is in his Seventh House and is conjunct Uranus. This phase lasts a year minus five days, replaced by Moon-Mercury that focuses on the strongest planet in his chart. In 2017 there may be a sudden opening, the need for really creative thinking, and finally a deal. On another level, what happens to Edward Snowden is less important than the impact he has made, for good or not-so-good. Whether he’s a good person or a self-deceived person or a traitor is only so much verbiage. Whether he has truly compromised national security is a question to be answered better by others. What is important to me is that we are now discussing the NSA and possibilities of unlawful invasions of privacy, and the relationship between the various US military and security agencies and Silicon Valley. This is clearly not Snowden’s triumph — it is Mercury’s triumph. Mr. Crane: As usual, this piece is well-written and thought-provoking. Just one question: I notice you refer to “Mercury, conjunct the Ascendant in its own sign and oriental (if out of sect in his diurnal chart).” The Sun is later by degree than Ascendant, thus below the horizon. 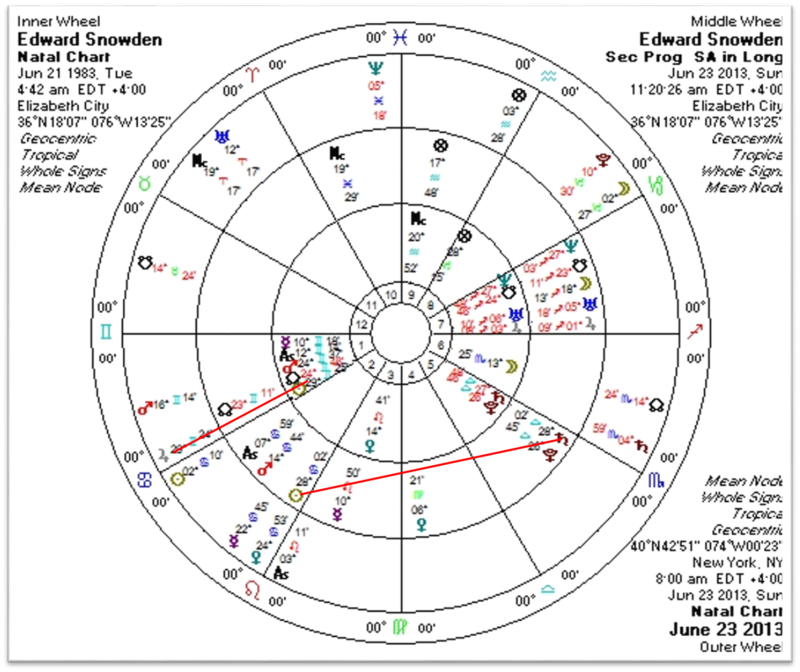 Are you considering this chart diurnal because Sun and Ascendant are in same sign?